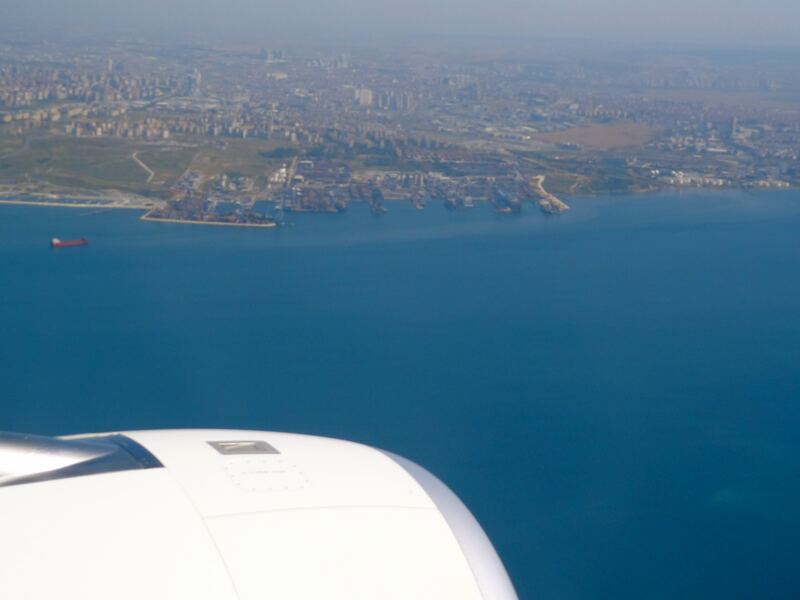 Flying Over The Bosphorus in Style: Turkish Airlines Review. My trip to Spain materialized so quickly and unexpectedly, that I really didn’t have enough time to contain the excitement of flying business class on Turkish Airlines, revisiting Turkey enroute, and losing myself on the cobbled streets of Europe again. The start of the trip felt like I was coming a full circle; my tryst with travel blogging took a serious turn on my first Euro trip a little more than a year ago, and this week-long invitation from Spain Tourism meant everything I had worked so hard for and dreamt of, was finally coming true! On an early Tuesday morning, with a hastily packed backpack and not a wink of sleep, I made my way to Delhi’s international airport, and quickly surrendered to the pre-travel pampering of business class; priority check-in, escorted security check, breakfast buffet at the airport lounge, untimed Wifi, and most importantly, relaxing sofas to catch a quick nap. On board the 7.5-hour flight to Istanbul, I tucked in on my fully reclining lounge seat, and slept like a baby cuddled in the lap of luxury, much to the envy of economy travellers whose shoes I’ve filled only too often! As we geared up for landing, I woke up to that stunning glance of the Bosphorus that made me fall in love with Turkey the first time round. The minarets gradually became visible, the blue of the waters faded away in the distance, and with the thud of landing dawned a strange realization. I am coming home. In the transit area of Istanbul airport, Turkish delights were still on sale and the ice cream mischiefs still entertaining. I could pick out the familiar sounds of merhaba and tehshekuller from the conversations I overheard. I suddenly craved for menemen, gozleme, and kuru fasuliye, the three vegetarian dishes I encountered in many forms on my adventures along Turkey’s Black Sea Coast. I remembered, with a smile, why I was so charmed by Turkish men and equally taken by the beauty of Turkish women. I wondered if a familiar face might pop out, draw a heart on my palm, and hug me, for I am from Hindistan. Not much had changed since I left this airport two months ago; I was still hopelessly in love with Turkey and its people, and unknowingly, I was carrying bits of it around with me. 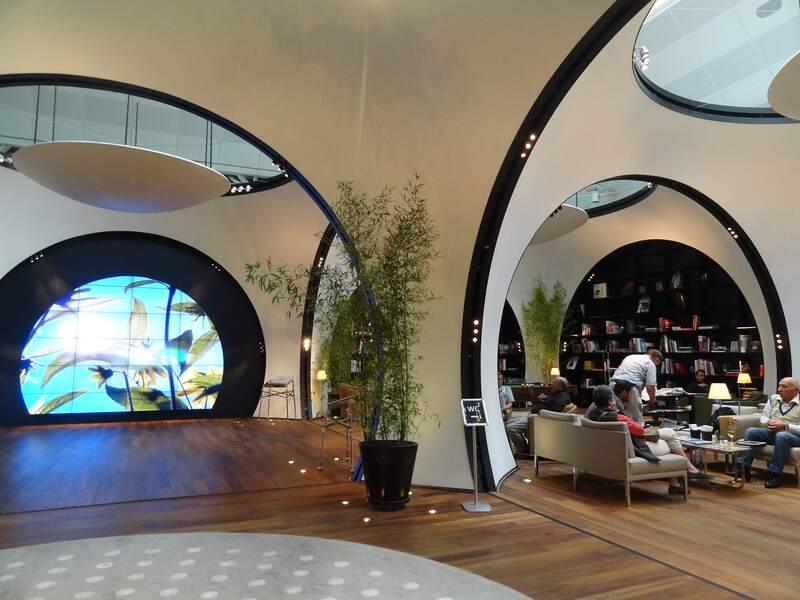 Other luxuries awaited me in Istanbul, like a 3-hour layover at the dome-shaped business class lounge of Turkish Airlines, before my onward flight to Barcelona. It was a mini carnival of sorts. A darkened theatre room with a big movie screen. A library of interesting multi-lingual books, with a quiet setup conducive to reading. A widespread buffet with mezze platters, breads, soups and veggies. A live counter serving pide. A dessert spread stacked with Turkish delights and chocolate cakes. A drinks counter, an open wending machine, and a table of flavored Turkish Çay. A grilled-snacks stall. A pool table and a piano at the far end. People lounged around, talking, eating, drinking, surfing (using the free Wifi), savoring the greatest luxury, that of time. I indulged myself and my memories of Turkey, and before I knew it, we were boarding for Spain. Turkish Airlines CIP business lounge at Ataturk airport, Istanbul. 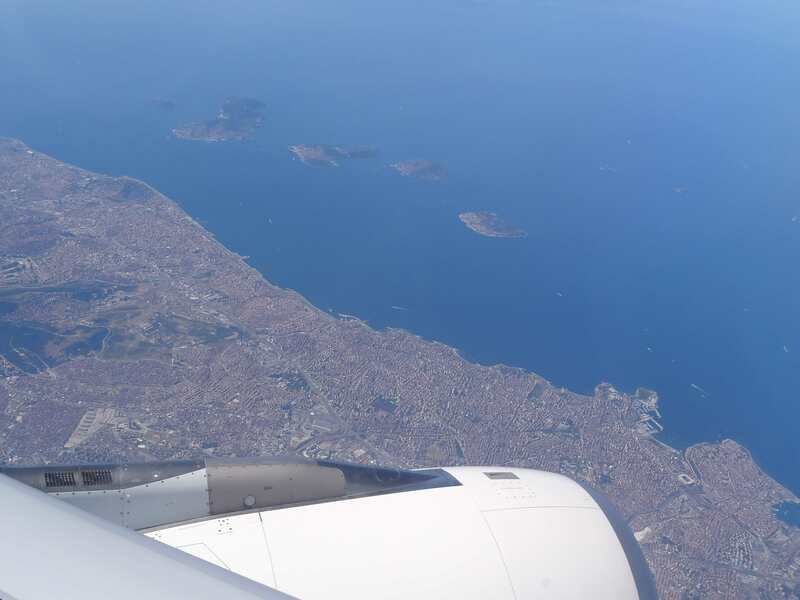 On the 2.5 hour flight from Istanbul to Barcelona, I chose to stay awake as we flew over the Bosphorus and up into the clouds, browsing movies on my half inclined bed seat. I savored the Turkish wine served on board with my nostalgia and some excellent cheese, and perhaps for the first time in the history of flying, I loved the vegetarian food offered; a mezze with breads, hummus, stuffed eggplants, zucchini, and aubergine, followed by a main course of kuru fasuliye (a Turkish dish of chickpeas) and saffron rice. In-flight food in Turkish Airlines business class. By the time we were landing on the shores of Barcelona, I was afflicted with an unexplicable craving for Turkey, as much as I was by the excitement of finally arriving in a country I had dreamt about forever. That is the paradox of travelling I suppose; it is only when you leave behind a place you love, that you can fall in love with another. Luckily for me, flying Turkish Airlines meant I could rekindle my love affair with Turkey, even if only for a few fleeting moments. What about you, have you flown or would you like to fly Turkish Airlines? Join me on Facebook and Twitter for my live adventures around Spain. I have never travelled by Turkish airways but my experience with Etihad and Emirates have been fine. Fair enough 😉 Time to plan a trip to Turkey / Europe then! I am so addicted to your blog. You may not remember me, I had enrolled for the spiti trip from your site India untravelled. Your travel encounters are marvellous,and kudos for coming such a long long way! Way to go. Hi, I’d like to ask you a question about the airlines. My parents are in their mid 50s and planning to visit London for a couple of weeks. I happened to see the images of flat bed offerings to business class on the Turkish Airlines’ website. Now, these will adequately cater to my parents’ convenience. However, I am skeptical about the PR images on the airline’s website. Are the business class seats on the Delhi-Istanbul sector actually flat-bed convertibles, or do they just recline more than the ones in the Economy class? Is it possible to sleep properly on those beds/seats? Secondly: How’s the transit process at the Istanbul airport? Any room for unpleasant surprises? I am visiting your blog for the first time and would deeply appreciate any inputs you could share on the above. It would help in making my parents’ journey that much better. Thank you, and good wishes. Yes indeed, the business class seats on the Delhi-Istanbul sector are fully reclinable lounge seats. They become flat beds and are very comfy to sleep on. I believe on flights less than 4 hours, this isn’t so (like the Istanbul – Barcelona sector) – on those flights, they simply recline more than the normal seats. The transit process at Istanbul is quite straightforward. You need to go through security check (where they often make you take off your shoes, jackets, belts etc), but it’s pretty quick. After that, as a business class passenger, you have access to the swanky Turkish Airlines lounge – with lots of great food, free Wifi, sofas to relax on, computers to surf, and lockers to leave your luggage. One tip – if your parents have any meal preferences, please be sure to indicate that to the airlines atleast 48 hours in advance of the flight. I found myself fighting to get a vegetarian meal on a recent flight, because I hadn’t indicated one before. Previous PostI’m Going to a Country I’ve Dreamt About Forever! Next PostMy First Impressions of Spain.